Ease-of-Use and Versatility! That's why you should buy the 24-Volt YardStick Cordless Edger. I did. 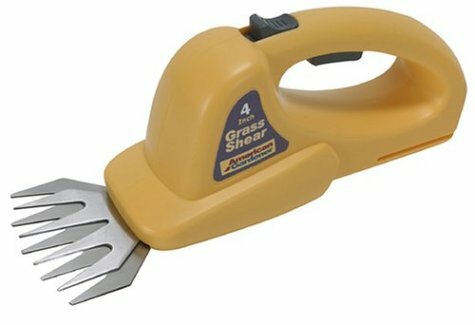 Think about it, why do you avoid trimming your lawn each and every week? The trimming and edging really doesn't take that long. In my case, the reason I only trimmed about once every three-weeks was, (1) I needed to uncoil one 100 ft. extension cord for the front yard, (2) secure and tie the cord at the source and around the trimmer's handle (to avoid the "Houston, we've got a problem" power outage), (3) avoid the cord itself, (4) work a strategy for getting the cord around trees and flower beds, (5) trim the yard, (6) then rewind and store the cord... only to repeat the process for the backyard! All the real work was in the prep and storage time. What needless pain. So, I did the research, and my wife got me the YardStick for Father's Day. I looked at other cordless trimmer/edgers, but the recommendations on Amazon for the YardStick, countered by user cautions/comments about other battery (awkward position of start/power switch) and gas edgers (noise/hassle), helped me take the plunge and try American Gardener. 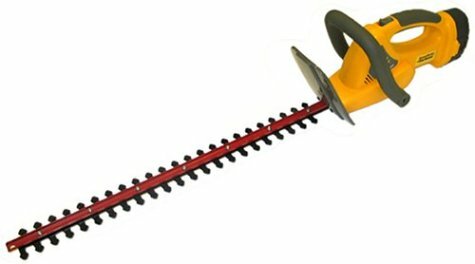 A look at American Gardener's web page will help anyone understand that "trimming is their thing." I knew I'd received a quality product right out of the box. 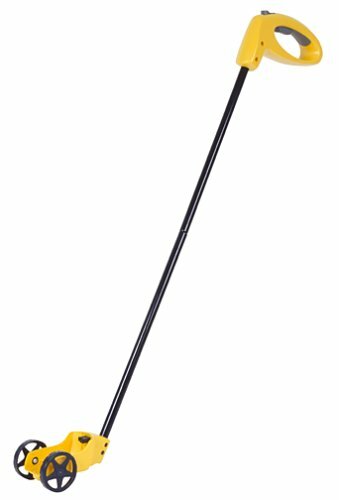 The YardStick, although not a lightweight, was balanced, comfortable to hold, easy to maneuver while being rugged with an elegant/practical design. I'm a tall person, so the "turn style-like" handle adjustments and easy conversion to edger-mode were important. The test drive was a blast. I was amazed at the "quiet" torque created by the 24-volt powerhouse. Cordless has come a long way. This is also the only dual ball-bearing motor I could find, and it hums. The precision of the edging feature was a welcomed surprise. The chore that used to waste a good 35 minutes, now only took about 12- front AND back! Then, I just placed the YardStick in the charger for next week. Cool. I purchased my unit two weeks ago after reading the rave reviews. I too was ready to abandon my stinky gas trimmer. I was initially optimistic when I opened up the unit. The unit was a bit heavy, but well balanced, and I liked how easy it was to spin the handle on the unit to switch the head from horizonal to vertical. The symmetric switch arrangement was intuitive and easy to use. After charging overnight, I headed out to start trimming. Almost immediately the spool feed became a real pain. The line would not feed smoothly, making it necessary to remove the spool to advance the line manually almost every time. (I now know why they include a second spool for free...). This weekend I brought it out for its' second use. This time, the spool kicked out a double length of line. This extra amount of line should have hit the line cutter and been trimmed off. Instead, the line wrapped around the cutter and SHEARED IT OFF, sending the nice sharp chunk of metal flying. 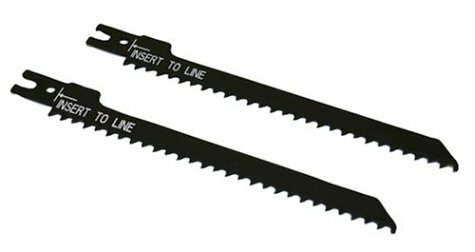 Since the line cutter is riveted to the line guard, it is not a user replaceable item. I'm sending it back in the morning and looking at other models. I haven't ruled out other American Gardner products, but I think I will pass on this one. Given the prominently featured rave reviews, I wonder what changed at American Gardener in the last year. I've just taken it out for a spin, and was deeply disappointed in the runtime off a fully charged battery. After 15 minutes of trimming weeds along the perimeter of our jungle-surrounded lot, it was still willing but wimpy. Perhaps runtime varies with the nature of the trimmee: whispy grass along the flower bed edging might not use much battery power. Vigorous, rampant growth might eat the battery alive. String advance is, if anything, a little too easy. Bumping the ground accidentally advanced the string more than I intended. But that's a good thing, compared to the wrestling matches I've had with string and pliers on other trimmers. I'm still glad we purchased this unit because frankly, my attention span doesn't last much longer than fifteen minutes anyway, and the mere touch of my hand is death to a 2-cycle engine. We have a gas-powered string trimmer, but I can't start it to save my soul, it's loud, it's stinky, and it's too heavy for me. So this trimmer will actually get a lot of use around our weedy lot, in spite of the lackluster runtime. * No gas, no oil, no exhaust fumes! Bottom line: Nice idea, run time would be OK for smaller lots, but quality, especially on the the trimmer line blade, is lacking. If the blade wouldn't have broken, I might have rated it 3.5 stars, instead I will be giving it to UPS to return to Amazon. I purchased this because my wife couldn't handle the larger gas trimmer I have. It does a great job on "LIGHT" weeds and grass. If you looking to cut heavy weeds or brush save your money. It does an excellent job on what it's designed for. The trigger design isn't the best and could be improved. I also purchased another battery because it only runs strong for about 20 minutes. It's quite, light, inexpensive and pretty easy to use. Just make sure that you're going to trim grass or light weeds. For that it's a good buy. 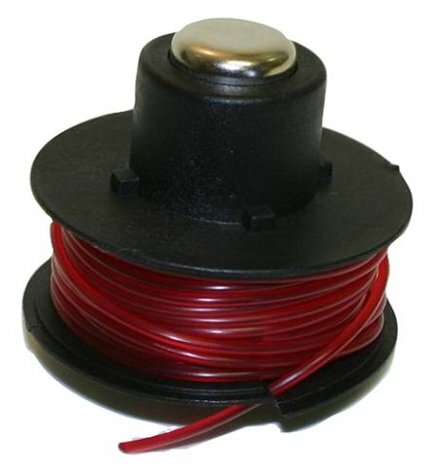 I have yet to receive the extra line spools I ordered from Amazon. 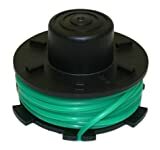 If I can't get replacement line spools then this product would be worthless. 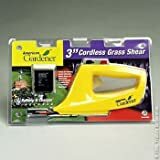 After a lot of research for a cordless line trimmer I found previous critiques by people who purchased this item to be extremely helpful and more reliable than any other source. My trimmer arrived yesterday. It was easy to assemble, charge the battery and my yard was perfectly trimmed within the hour. 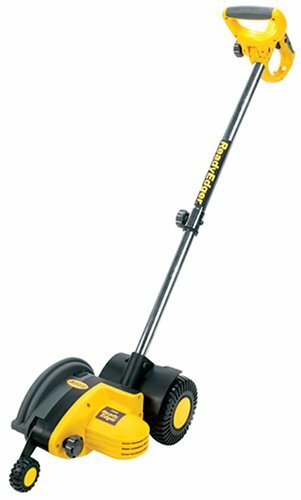 It is an ideal tool for a woman who does not want the bother of a gas operated trimmer or the inconvenience of an electric cord. I am 71 years old and anticipate using this trimmer for many years to come. I thank other consumers for sharing their comments which are most helpful to others! 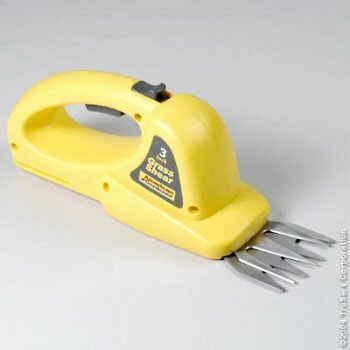 If all you need is a trimmer for the average suburban yard, this will do great! I did my whole yard in about 15 minutes and it had plenty of charge left. My neighbor was amazed at how well it worked and he spent over $200 for a gas trimmer. Less noise, no gas and oil to mess with, what could be better. I am getting the hedge trimmer next! I was very disappointed with this item. It is very difficult to hold down the safety button and trigger at the same time. My hand gets tired after about 5 minutes. It does not trim as closely to mailbox, flower boxes, etc. as I would like. 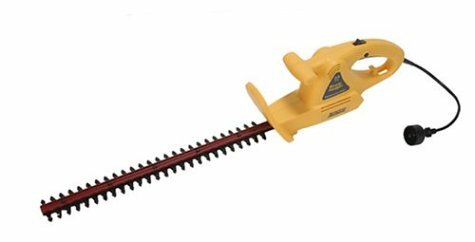 For 900053 YardStick Cordless String Trimmer and Edger. Product comes fully assembled except for the blade. Does need initial charging of 16 hours. I used it on 10 branches approx. 3-4 inches thick the first time out and it did the job. I don't know what the problem was with the guy in Texas that recommended the chain saw type of pruner. Maybe he sells them. Anyway with no gas & oil to mix, no winterizing, no cords and totally portable this is one nice yard tool. This is a poor excuse for a trimmer. I purchased this for my father to use on his tree filled property, but he said it cut only very small braches, and not very well at that. I ended up buying a gas powered pole chain saw pruner for the same price and it did the trick. I took this one home to try and found that it was not powerful enough to cut, and hard to control at full extension. It will be in the next garage sale. Product comes fully assembled except for the blade. That took all of 2 seconds to install. Needs initial charging of 16 hours. I used it on several branches and it did the job. You need eye protection to avoid the saw dust coming down. It's a little akward at first, but you get the hang of it quickly. The only thing I would say is that I agree with the previous writter. It needs a second hand grip up on the pole, for extra support and stability. Otherwise, it's a nice unit. No gas & oil to mix, no winterizing, no cords and totally portable anywhere and everywhere. 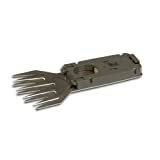 For American Gardener 900054 Clip and Shear and 900056 4-inch Grass Shear. 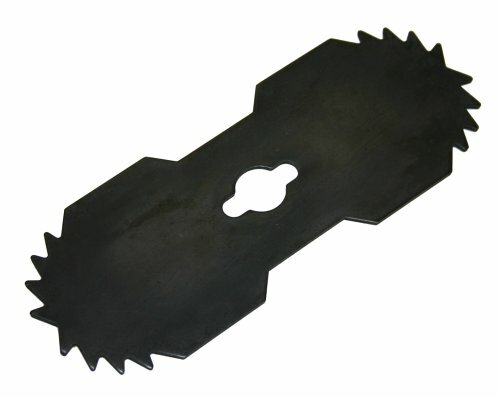 The hedger runs for about 45 minutes and goes through 1/8 inch branches easily. Anything larger will jam the blades. The top handle is not well designed. It takes a lot of stress on the two round/angled connection points to the body. After a couple of weekends, the top handle broke off. American Gardener (through a repair company called Utility Electric) sent me a replacement handle. I've learned to try and put most of the stress on the trigger handle and use the top handle gingerly. 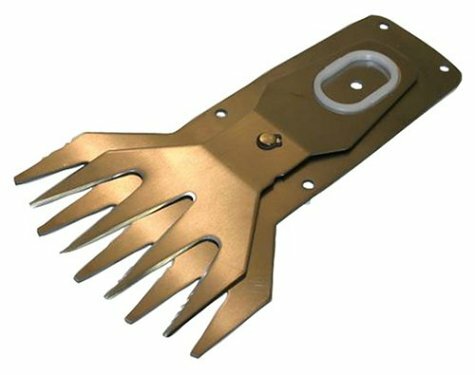 This hedger beats dragging a cord around. I have not tried the Black and Decker or Toro cordless for a comparison.